Luther Harvey sought adventure on the Great Lakes and in soldiering. He found Lake Erie, General William Henry Harrison and Commander Oliver Hazard Perry. He created a laundry list of occupations. He was a mail carrier, soldier, tavern keeper, and most of all, a mariner and adventurer. After following an inherited wanderlust where it led him, Captain Harvey selected Monroe, Michigan, as his permanent harbor. Luther Harvey Chose Lake Erie and Soldiering Like many other New Englanders, Luther Harvey's family frequently moved around between 1789, the year he was born, and 1810, when he went to Pennsylvania on his own. The family lived in Genessee and Buffalo, New York, where he first became acquainted with Lake Erie. From an early age, Harvey avidly followed the commissary windjammer that sailed up and down the lakes bringing Irish pork from Canada and salt from Onodaga. There were no improved harbors on Lake Erie in the early 1800s and sail boats had to be poled up the Niagara River. An early history notes that "the crew of eight polers refreshed themselves from the tin cup hung from the barrel of Pennsylvania rye in the stern." In 1810, Luther Harvey moved to Pennsylvania and then to Conneaut, Ohio, with a company of eastern settlers. News that the United States had declared war on Great Britain in the summer of 1812 motivated Harvey to travel to Cleveland, Ohio. Now 23, Harvey enlisted in the state militia that Ohio governor Jonathan Meigs, Jr., had organized to defend frontier outposts. He served as a private in Captain Clark Parker's company from August 1812 until February 1813, and his company was sent to protect the settlements along the Huron river in Ohio. Quickly Luther Harvey discovered that garrison duty in the blockhouse on the Huron River didn't provide much adventure, so he decided to change locations. He transferred to the service of Major Lupper, a commissary contractor. The major hired him to carry disptaches around Lake Erie from Cleveland to General Harrison at Fort Meigs, near Toledo. While Luther Harvey served in Captain Parker's militia, the River Raisin militia mustered for service and in the summer of 1812, the militia began to build a military road, later named Jefferson Avenue, that would link Detroit with Ohio. As soon as the River Raisin Militia had completed the road, General William Hull, who commanded the United States forces in the Old Northwest, marched several thousand Ohio volunteers over it to defend Detroit. General Hull had planned to capture the British Fort Malden in Amherstburg, Ontario, but changed his plans when the Indian allies of the British cut off the flow of supplies. General Hull tried three times to open the road, but he couldn't break the grip of the Indians and the British. Facing an army of British soldiers and Indians and convinced that he could not prevail, General Hull surrendered his entire army to the British at Detroit on August 16, 1812. The River Raisin militia reeled from the shock when a British officer arrived in Frenchtown- later Monroe- on August 17, informing them of the surrender of Detroit and ordering them to surrender. The British briefly occupied the settlement, burned its blockhouse, and then departed. After General Hull surrendered Detroit, President James Madison appointed William Henry Harrison to head the reorganized Army of the Northwest. In January 1813, General William Henry Harrison vowed to recapture Michigan. One of his first moves was to divide his army in half. He led one column to Upper Sandusky and Colonel James Winchester led the other further west to the settlement of Frenchtown on the River Raisin. Luther Harvey moved his family to Huron, Ohio, and enlisted in the American militia. He was eyewitness to the aftermath of the Battle of the River Raisin. Captain Luther Harvey enlisted in Captain Parker's militia and served for a year. He discovered that garrison duty in the blockhouse bored him, so he applied for a transfer and found himself rubbing shoulders and delivering supplies for General William Henry Harrison. While Captain Luther Harvey hauled supplies between Cleveland and Monroe, the British and Americans were fighting a fierce battle. By November 1812, a detachment of Canadian militiamen armed with a small cannon were stationed at Frenchtown to monitor the advance of another American army. General James Winchester, an elderly Revolutionary War veteran, commanded this new army which had been recruited in Kentucky in August 1812. General Winchester sent over 600 men to Frenchtown to fight the British. They arrived on the afternoon of January 18, 1813, and took positions south of the River Raisin. They were reinforced with 100 men from the River Raisin settlement. About 200 Potawatomi Indians and 63 Canadian militiamen faced the American forces. The Americans routed the Canadians and the Potawatomi Indians and drove them into the woods about a mile north of the settlement. The Americans set up camp among the homes on the north side of the River Raisin and the British and Indians retreated north of Brownstown, across the Detroit River from the British base at Fort Malden. Arriving with reinforcements and confident from the victory, General Winchester spread his men throughout Frenchtown. He chose an isolated house far from the settlement as his quarters. Colonel Henry Procter, the commander of the British forces, called out all of his available troops- about 500 British soldiers and about 500 Indian warriors under Wyandot chief Roundhead. They hurried across the frozen River Raisin toward Frenchtown. The British and their Indian allies staged a surprise attack on the Americans at Frenchtown at dawn on January 22, 1813. Chief Roundhead captured General Winchester who had attempted to join his command from his distant quarters and the General surrendered his entire army. The Kentuckians under General Winchester surrendered only after insisting on a promise that the American wounded would be protected from the Indians. Colonel Procter and his soldiers retreated to Brownstown to avoid what he thought would be a counterattack by General William Henry Harrison. On January 23, 1813, all of the British guards supposedly protecting the wounded Americans left and the Indians returned to the settlement. They plundered homes and the wounded for treasures and killed and scalped between 30 and 60 of the wounded American prisoners, many of them Kentucky volunteers. They set fire to houses and tossed bodies into them. They claimed the wounded who could walk and marched them to Detroit to ransom them. 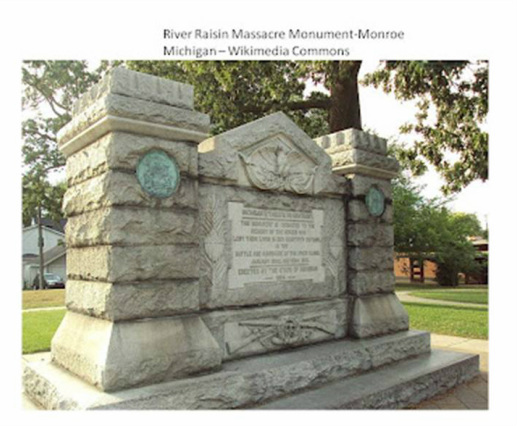 American newspapers quickly called the battle and its aftermath "The Massacre of the River Raisin." Americans in the west rallied to the battle cry of "Remember the Raisin." Luther Harvey was one of the men who inspected the battlefield and tried to help the wounded and bury the dead. General William Henry Harrison had planned a winter campaign for his Army of the Northwest, but the defeat of Colonel Winchester at Frenchtown forced him to change his plans. Instead, he decided to build Fort Meigs at the Maumee Rapids. Luther Harvey and a few companions delivered messages from Cleveland to General Harrison at Fort Meigs. In February 1813, Harvey took the job of driving six yoke of oxen hauling flour and other stores from Cleveland to Fort Meigs. Harvey was convinced that the massacre at the River Raisin had frightened General Harrison and he planned to abandon Fort Meigs. Resolutely, Harvey continued to deliver his supplies without spotting any British soldiers or Indians, and his supplies kept the garrison alive the rest of the winter. Captain Harvey delivered supplies for General Harrison and witnessed the Battle of Lake Erie. He settled in Monroe, Michigan, and resumed his voyages on the Great Lakes. Captain Harvey served in the American militia, delivered supplies to General Willaim Henry Harrison, and helped bury the victims of the River Raisin Massacre. By August 1813, Captain Harvey and his family had completed a circuit of the east and south shore of Lake Erie and were living in Huron, Ohio. Commander Oliver Hazard Perry had finished building his fleet at Erie, Pennsylvania, and had dropped anchor at Sandusky, Ohio. Harvey decided to visit the fleet. He found a leaky batteau that some Americans had used to flee from Maumee, loaded it with supplies, including butter and roasting ears, and rowed out to the fleet with several farm boys. Perry 's sailors eagerly welcomed this spontaneous supply ship. After watching the sailors unload his groceries on Perry's flagship the Lawrence, Harvey demanded to be taken aboard to meet Perry himself. He chatted with Commander Perry on the deck of the Lawrence.The purser paid him well, encouraging him to return soon. Harvey did soon return, but this time to Put-in-Bay, where Perry’s fleet waited in battle formation for the British. Along with many other observers, Luther Harvey watched the Battle of Lake Erie from a nearby island, possibly Kelly’s or Catawba Island. When the guns stopped, he hurried to the scene of the battle and observed the wreckage of British and American vessels. He saw broken spars, blood-stained mattresses, clothing, and tangled rigging cluttering the water. Again, Luther Harvey met Captain Perry and Perry insisted that Harvey pilot a boat load of Kentucky militia across Lake Erie to occupy Fort Malden which the British had abandoned as soon as Perry won the Battle of Lake Erie. When they reached Fort Malden, the Kentuckians burned the abandoned home of Colonel Elliott, because they blamed him for the murders of their fellow militiamen at Frenchtown. After he left Fort Malden, Luther Harvey went to Detroit which the British had also abandoned. He said it was a dirty, disagreeable place, but did enjoy watching Jefferson Avenue being plowed the first time for grading. In 1815, Luther Harvey moved his family from Detroit to Frenchtown, bringing him full circle around Lake Erie from Buffalo. One of the first people to come into the abandoned Frenchtown settlement after the battle of the River Raisin, Harvey made Frenchtown his home after that. He opened a tavern as his first business venture in his new home, and he immediately took the lead in community affairs. The first Fourth of July he spent in Frenchtown, Harvey took part in a patriotic and gruesome exercise. Many of the men and boys of the reviving village spent the day wheeling carts along the banks of the River Raisin, gathering up the bleached bones of the victims of the massacre which had taken place two years before. They found bones as far south as Plum Creek, where the British and Indians had pursued the beaten Kentuckians. They also collected tomahawks, cannon balls, muskets, bayonets, parts of uniforms and other equipment that the Indians had overlooked. His tavern keeper life soon bored Luther Harvey who was only 26 when he moved to Frenchtown. In 1817, he went back to being a lake captain, and owned and sailed several sailing sloops and schooners . The Detroit Gazette of April 17, 1818, records Captain Harvey as bound for Miami in the schooner General Brown. In 1820, the Fire Fly, Capt. Luther Harvey, 2 tons. is listed in the roster of vessels plying the Maumee River. Captain Harvey sailed the Fire Fly, and often voyaged to the then almost unknown harbors of Lake Huron and Lake Michigan in safety. The Detroit Gazette of April 8, 1825 lists the Fire Fly, Captain Harvey, from Miami as arriving from Buffalo. In November 1828, the Detroit Gazette has Captain Harvey arriving from Miami in the Regulator. For nearly thirty years he sailed the lakes, and so skillfully managed his ships that he very seldom suffered an accident or a loss. The 1870 census shows Luther Harvey, age 82, from Vermont living in Monroe and his wife, Mary, 73, born in Canada, and keeping house in Monroe. His son and wife and children also lived with him. He died in Monroe on Sunday September 14, 1878. Francis A. Dewey, "A Sketch of the Marine of Lake Erie Previous to the Year 1829," January, 1881. Tippecanoe: Some Aspects of the War of 1812. Michigan State University Press, 1969 Eckert, Allan W. A Sorrow in Our Heart: The Life of Tecumseh. Bantam Books, 1992. Gilpin, Alec R. The Territory of Michigan, 1805-1837. Michigan State University Press, 1970.